On Friday, most of the group drove over to Huntsville to tour the Huntsville Botanical Gardens and the US Space & Rocket Museum. 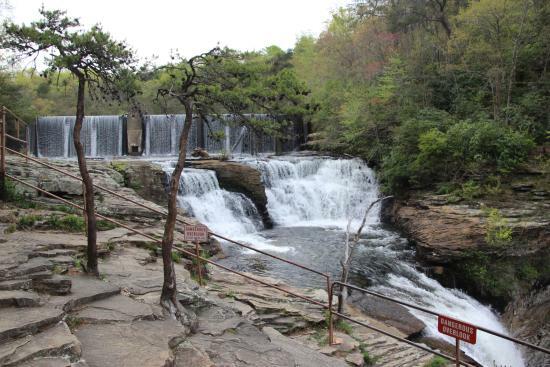 We had planned to go but, in my new roll as the clubs rally coordinator, Bev and I went over to the Fort Payne area to check out three campgrounds as potential rally sites. Unfortunately, none of them would do for our larger rigs but the day wasn’t a total waste as we had two enjoyable experiences. 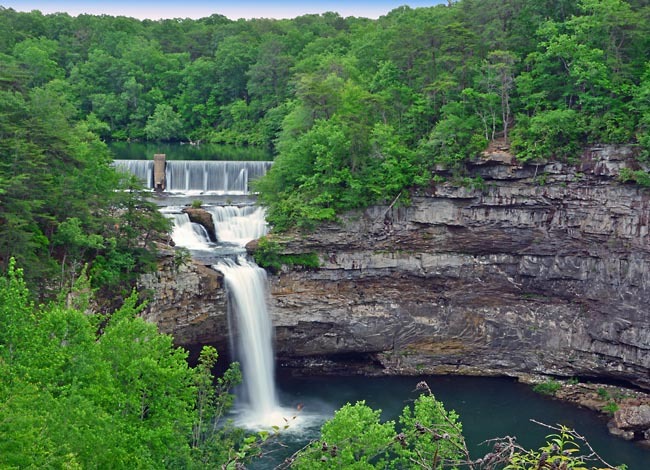 The first was a visit to the DeSoto Falls in the state park and it was pretty impressive, containing a dam and the 107 foot falls. 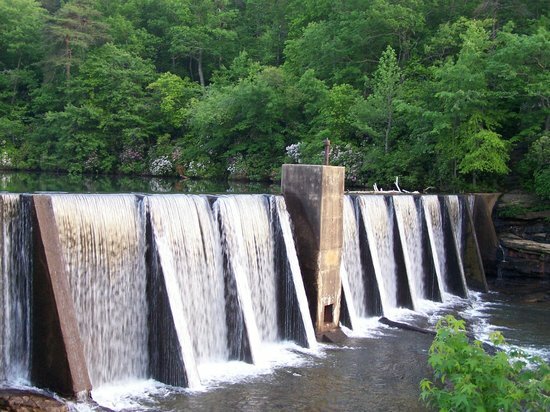 The A.A. Miller Dam built as a hydroelectric project in mid 1920’s, and it is followed by the first natural falls and ending with the lower falls that dumps into a beautiful pool - pics from the web with the second one being what we saw from the visitors overlook. We missed our FMCA Chapter’s September rally while we were in South Dakota so we wanted to be sure we made this one. The nine coach group got together at Windemere Cove on Guntersville Lake just south of Scottsboro, AL which was about a three hours drive from home. It was an easy drive down I-75, I-24, and US-72 at least until we got on AL-67 which was a narrow, curvy road along the banks of the lake. While it was a pretty drive and doable in a motorhome, it was a little stressful with no margin for error and no places to pull over and let others by – fortunately it was a good road surface and only lasted 10 miles. Like many others these days, Windemere Cove is a place that wants to sell its lots rather than just rent them and I can see why it would be appealing and it is very nice. The streets are paved, the sites are well spaced with concrete pads to park on, and excellent grass between the pads. It has a nice club house with a kitchen, rooms to eat and watch TV, showers rooms, and a pool along with a boat dock, launching ramp, and a big fire pit. Here’s a shot from Google Earth and it appears they have plenty of room to expand to the left. As I mentioned in an earlier post, we picked up some bison burger at Black Hills Meat Company in Hot Springs, SD and we used it as an excuse for a get together with some folks we hadn’t seen in a while. Bev also found some elk burger in the freezer, courtesy of my West Virginia family, and we had a little hamburger left from another meal so we decided to cook them all. Each of us then had a choice of the three meats and three cheeses – of course I made a little spreadsheet to keep track of the orders. The burgers were formed into six ounce patties, given a dusting on Montreal Steak Seasoning and a spray of Pam before tossing them on the grill. Here are one of each kind with beef on top left, elk on top right, and bison on bottom. 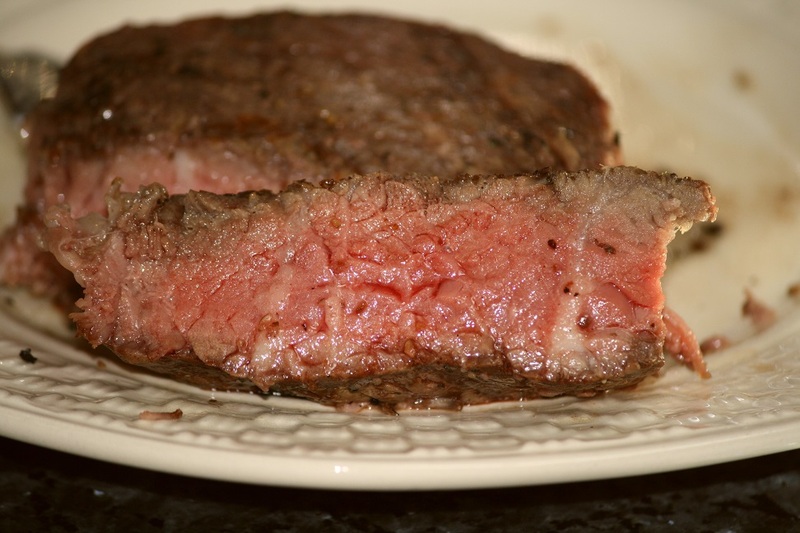 Note the beef has plenty of fat in it and that the elk is a darker red than the others. On the final day of our stay in the Black Hills, we went to Hot Springs, SD to visit a couple of attractions plus the Black Hills Meat Company where I wanted to get some bison meat to take home. They also had some great looking beef so we bought some steaks to grill when we got to Colorado Springs. However, the weather had other ideas as it was cold and rainy for our entire time in Colorado, so we brought the meat home to cook out with our neighbors (and trip companions). Here is a shot of the rib-eyes, bacon wrapped fillets (all about 1½ inches thick), and a T-bone provided by the neighbors - on each side, they got a light coating of Montreal Steak Seasoning and a spray with Pam. For sizing estimates, the rack they are on is 14" long and each rib eye takes up about half of it - the wires are 3/4" apart. After grilling, I was so focused on getting each steak cooked as ordered that I forgot to take some shots but here is one of the big piece I didn’t eat and I got it cooked just right for me. These were a challenge as I’m not used to cooking steaks this thick - but I believe I'll practice on some more of them. This was our second South Dakota meat market stop and these steaks were better than the first one and they were a big hit – Bev was the only one to finish hers. I'm certainly not a steak expert, but I can't imagine one being a whole lot better and if I lived out there, Black Hills Meat would be my regular steak supplier. I forgot to look at the prices but I remember they were very reasonable. I’ll tell you about the bison when we give it a try. Wednesday was seminar day for me and I attended four - Aqua Hot (our coach and water heating system), Carefree of Colorado (awnings), Kleen Tank (maintaining dirty tanks), Cummins Onan (electric generator) - and learned something important from each of them about looking after our systems. The seminars coupled with some things the Thor factory techs fixed on our coach and a tour of the Thor factory definitely made the rally worth attending – I may even go again next year, just to socialize with some of the folks we met. After several so-so meals, the supper of burgers, beans, and potato salad was very good. The biggest issue with the meals was the single serving line for 260 people that took 1:15 to serve everyone - I didn't bother going to breakfast after the first morning. We wrapped up our five week trip by attending the International Rally for the TDC at the Elkhart County Fairgrounds in Goshen, IN. Why would they pick here for a rally you asked – the Thor Diesel Factory is here as are 15 other RV mfgs. – something like 80% of America’s RV’s are made in the area and the local economy shows it. 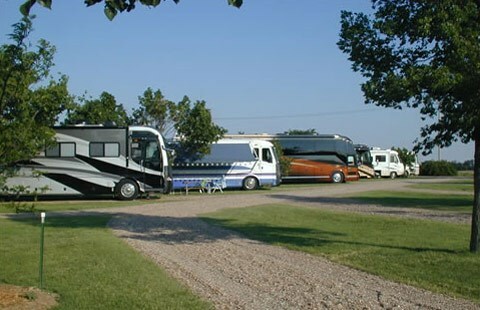 The fairgrounds are big and very well maintained – a pretty first class place – with lots of buildings for events and many, many RV spots in several locations so they could likely hold multiple RV events at the same time. A couple of shots from the web - we were next to the trees at the bottom of the second shot, which is the upper right corner of the first shot. After three fun days in Colorado Springs, it was time to head back east and we had four 300 mile travel days to get to the Thor Diesel Club Rally in Elkhart, IN. The first day we drove 291 miles, mostly on I-70, to the KOA in Wakeeney, KS. The roads in CO, both in towns and out, were the worst of the trip so far. As soon as we crossed the Kansas line there was a night and day improvement to the road surface. 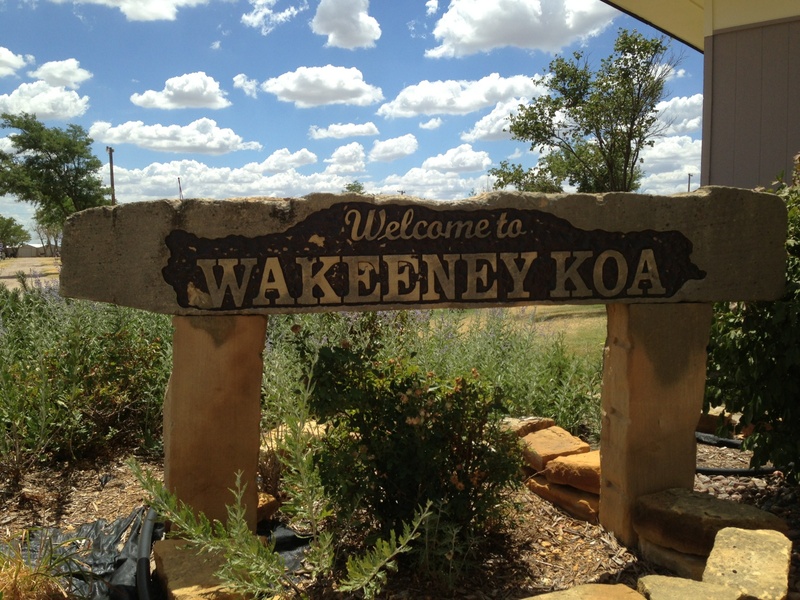 The Wakeeney KOA was a very nice place for an overnight stop with long, level pull through sites, decent room between sites, and a very good WiFi - this was our third stop here. Tuesday was our day to ride the Pikes Peak Cog Railway so we arrived at the depot at 12:45 for our 1:20 departure on a foggy and drizzly day. Based on the weather, I had very low expectations for our trip and commented that we would at least get to ride the railway even if we couldn’t see anything and wondered why I had brought my camera equipment along. Each of the cars can operate independently with its own turbo charged diesel engine and cog drive system – they are built Switzerland. For our departure there was a two car unit and our independent car, which carried about 100 passengers. We slowly made our way up the foggy canyon with very little to see but trees, rocks, and fog then all of a sudden we broke out above the clouds to bright sun and an amazing view. Here are a few shots of the trip to the top. Once on top we unloaded to visit the rest room, the gift shot, and the snack bar and to take more pics - I think Bev was cold. On the trip down we saw some big horn sheep at a distance and we saw marmots right along the tracks. It turned out to be a great trip and I’m really glad we did it - due to the weather, we never did see Pike's Peak from the ground. Wednesday was our last day and we decided to spend it driving to the other side of Pikes Peak to visit Cripple Creek and Victor and once again it was a foggy, rainy, cold day. The locals should thank us for bringing all of this rain to their area as it was warm and dry before we got there and was predicted to be the same after we left. Even though foggy and rainy, the Aspens were still very pretty. 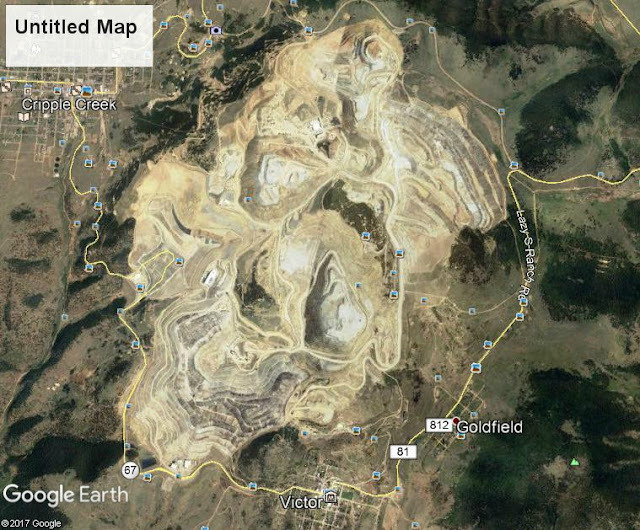 The Cripple Creek area is famous for its gold mines which have produced more gold than the CA and AK gold stirikes combined – Newmont is still running a huge mine there, we could only get shots of the outside but below is a Google Earth shot. It appears to be about 3 miles across and 5 miles long (it's 4 miles from Cripple Creek to Victor) leaving a giant scar on the earth. What we saw from the outside is on the lower left side around where the 67 is located. By comparison here is an old mine. Apparently Cripple Creek was in serious decline until Casino gambling was permitted and now it is a bustling tourist town thanks to the 11 casinos. This can be contrasted with Victor, which is in pretty rough shape. After visiting Victor, we returned to Cripple Creek for lunch at Maggie's Restaurant followed by a little gambling at the Colorado Grand Casino. I actually left the casino with $10 extra, which is a very rare event. Even with the bad weather, it was a good way to spend our final day in the area. One of the things we always do when in this area is meet up with friends Bob and Lea Ann (Highlands Ranch Foodie) who we met through the Blogosphere. As it turned out we picked the same three days to visit that they planned to be away to celebrate Chef Lea Ann’s recent graduation from the Cook Street School Of Culinary Arts in Denver. Since they were driving through Colorado Springs on their way to Taos, NM, we were able to squeeze in some time for an early breakfast at a convenient La Casita Mexican Grill location. This is a fast food Mexican restaurant with three locations in the Springs and a pretty good burrito with green chili. We had a nice visit and as always it was great to see them – so far my efforts to convince them to come east to visit with us have been unsuccessful. After breakfast, we drove the short distance to Old Colorado City which is a national historic district within Colorado Springs and pretty much of a tourist area with a shopping district featuring dozens of independently owned art galleries, boutiques, restaurants and special attractions. We just checked out what was there and made a stop at a French bakery, La Baguette. After our quick visit to Old Colorado City, we went back to the campground to pick up our travel mates, Pat & Steve, to take them to the depot for the Pikes Peak Cog Railroad. We then headed back to Old Colorado City where the ladies shopped and, being in need of a new wallet, I checked out a local shop and found two that I liked. They have been in business for 42 years and make their wallets form 100% leather and no cloth, which is what failed on my current wallet. We then headed back to the cog railroad for the trains return and got these two shots of Pat & Steve - notice the other passengers also waving. 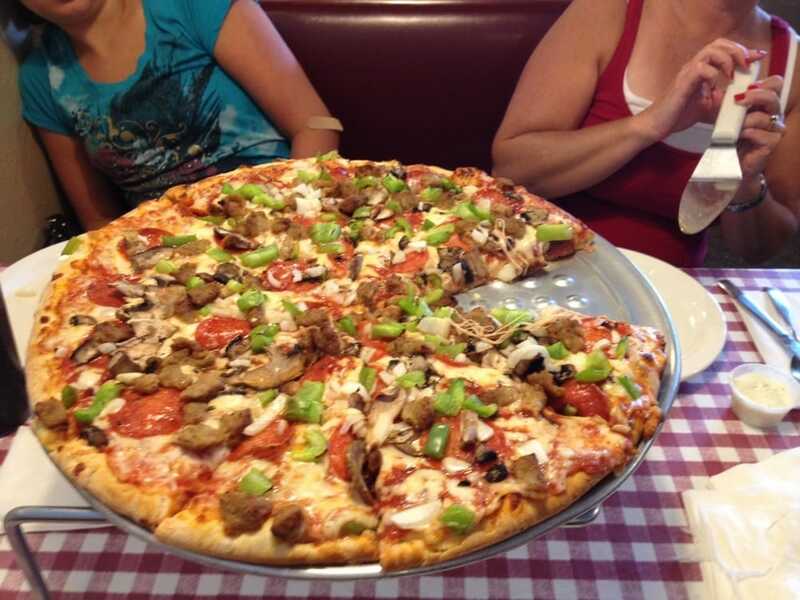 We were all hungry and decided to stop at Savelli’s Pizza for some highly rated pies. Since we, all wanted leftovers, Pat & Steve ordered a 14’ and we ordered an 18” which provided this supper and two breakfasts. 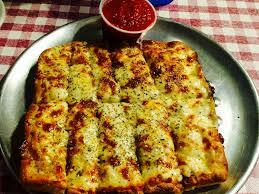 We also shared an order of delicious Mozzarella Cheese Sticks. We had the Savelli's Special Pizza - Pepperoni, mushrooms, green peppers, onions, Italian sausage, and a mozzarella/muenster cheese blend and pat & Steve had one with half All Meat Pizza - Pepperoni, Italian sausage, ground beef, bacon, ham, and a mozzarella/muenster cheese blend and half Veggie Lover Pizza - Mushrooms, green peppers, onions, tomatoes, black and green olives, and a mozzarella/muenster cheese blend. This is a shot of Savelli’s Special from the web. We all thought they were very good and Steve commented “I never thought I’d say this, but it has almost too much meat.” If you are in the area, I recommend you give them a try. After a drive around the Broadmoor grounds, where many deer were trimming their shrubs , it was back to the campground to say our goodbye’s as Pat & Steve were headed home early the next morning. This is the first time we have actually traveled with others and It was such a good time having them join us and Pat said it was one of her best vacations. 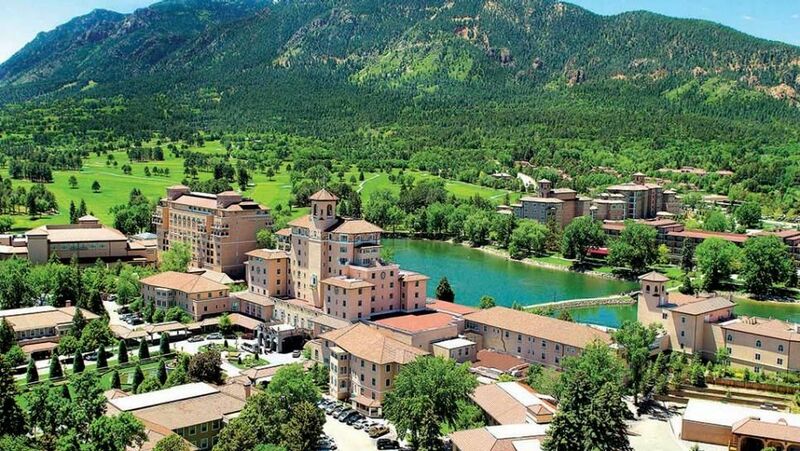 After talking with our friends Bob and Lea Ann and based upon posts on her blog (Highlands Ranch Foodie), we decided that no trip to Colorado Springs would be complete without a visit to the 5 star Broadmoor Hotel to partake of their Sunday Brunch – this is the reason we came to Colorado Springs a day early. The Broadmoor – A Luxury Colorado Springs Hotel – began construction in 1918 with the idea of being “The Grand Dame Of The Rockies” similar to the Greenbrier in the Appalachians of WV. In addition to the very upscale accommodations and dining at the large hotel complex, the resort has hosted several major pro golf tournaments and a World Figure Skating Championship. 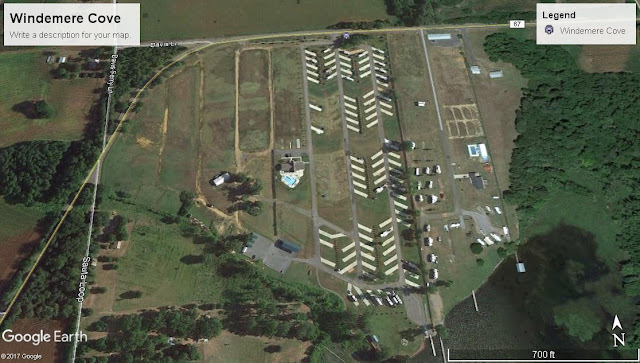 Here is an overhead shot from the web - it's both sides of the lake. After 12 full days in the Black Hills, it was time to move south. We left Custer, SD and drove down US-385, SD-89, and US-18 to meet up with I-25 at Orin, WY. The roads were all good, the scenery was nice and the only issue was the wind, which seems to always be present in that area. We pulled into AB Camping in Cheyenne, got set up and rested – I was tired from dealing with the wind as I drove our 12’x45’ sail all day. We had stayed at this place before and it is just a decent campground and good for a couple of nights. It does have two redeeming qualities though – a decent on site BBQ restaurant and very good WiFi.